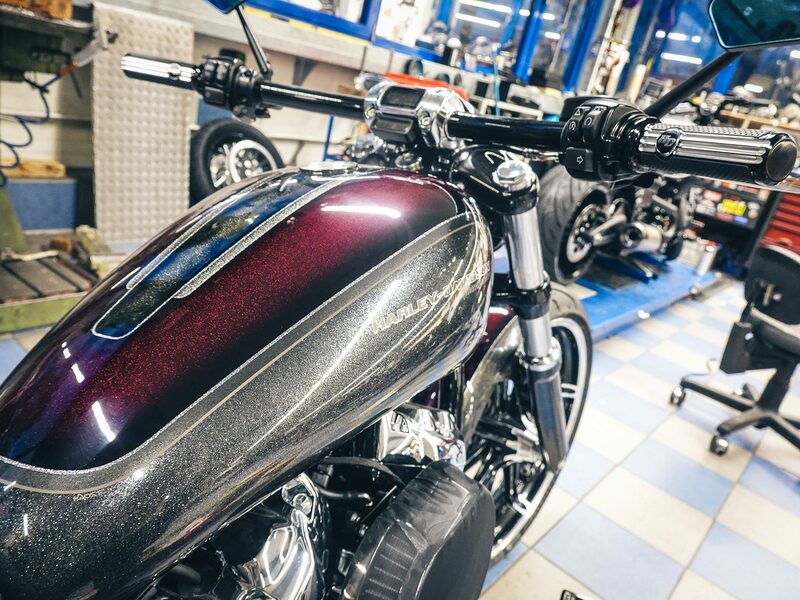 The most famous colour of 2018! 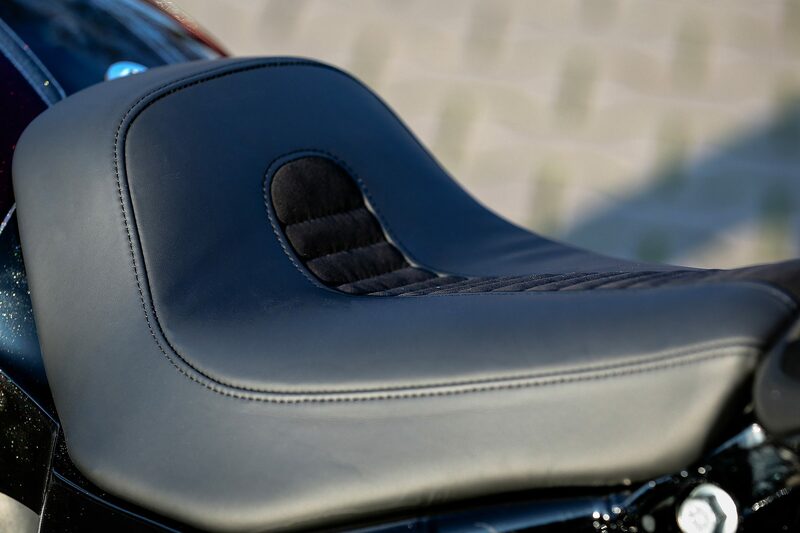 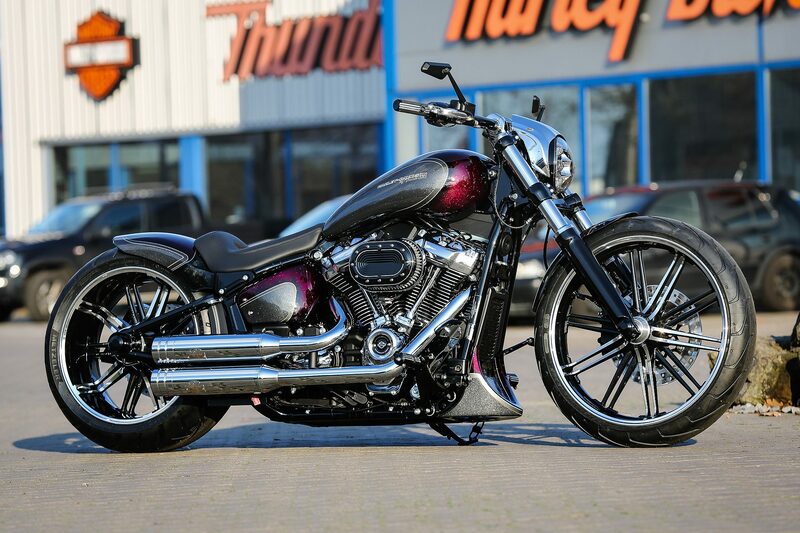 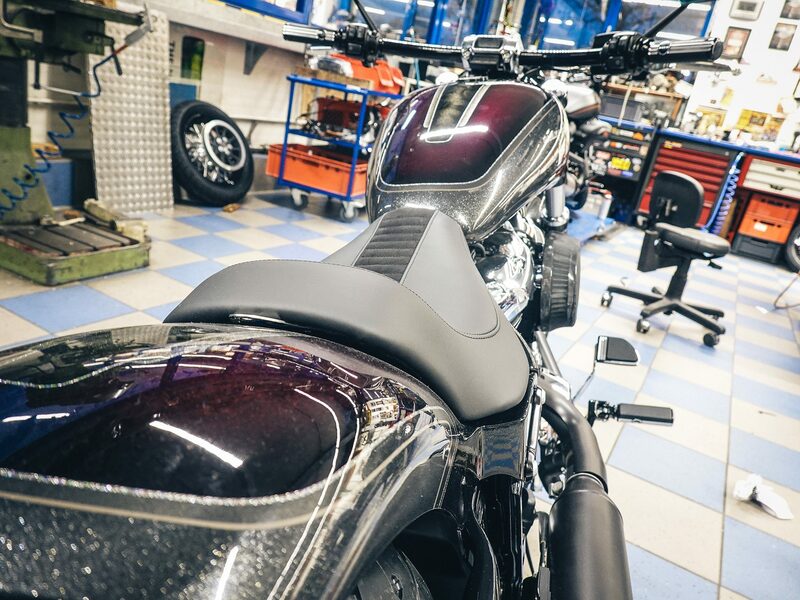 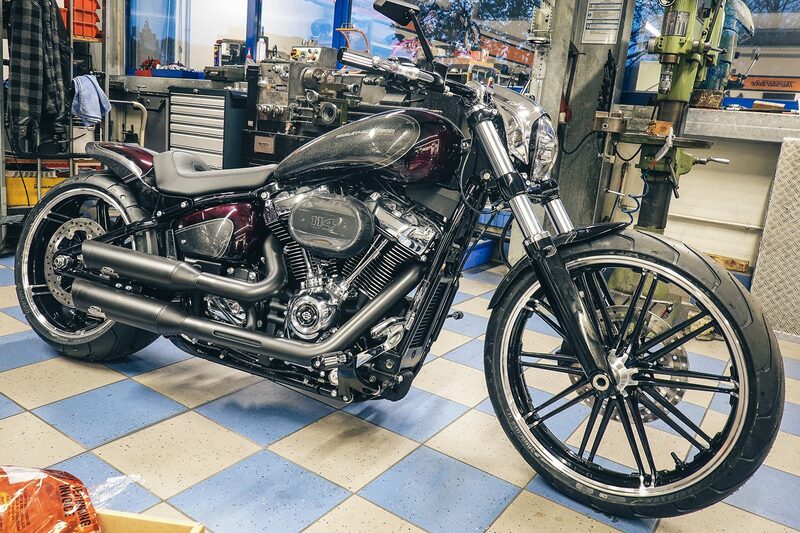 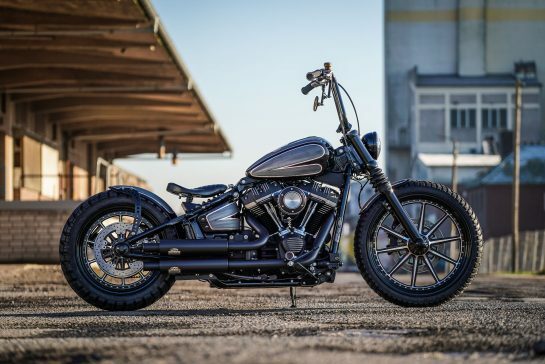 Since 2013 the Breakout model in drag look decorates the Softail series and offers for us again and again the ultimate basis for the conversion. 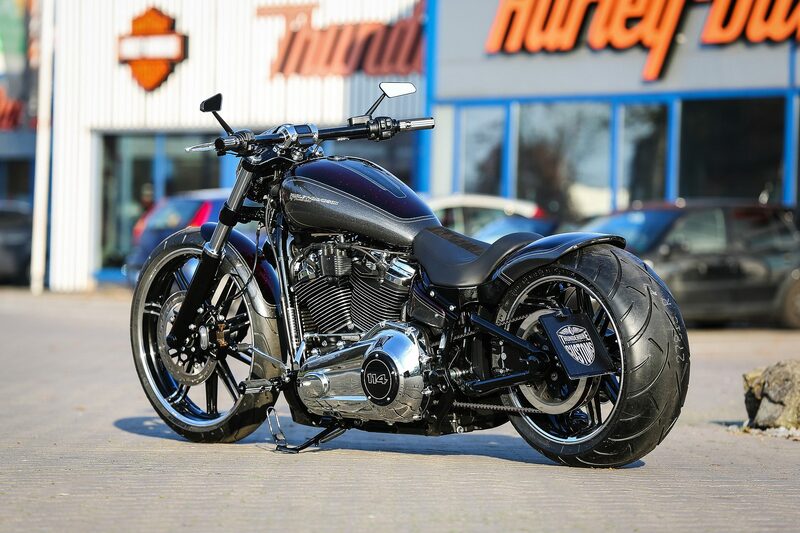 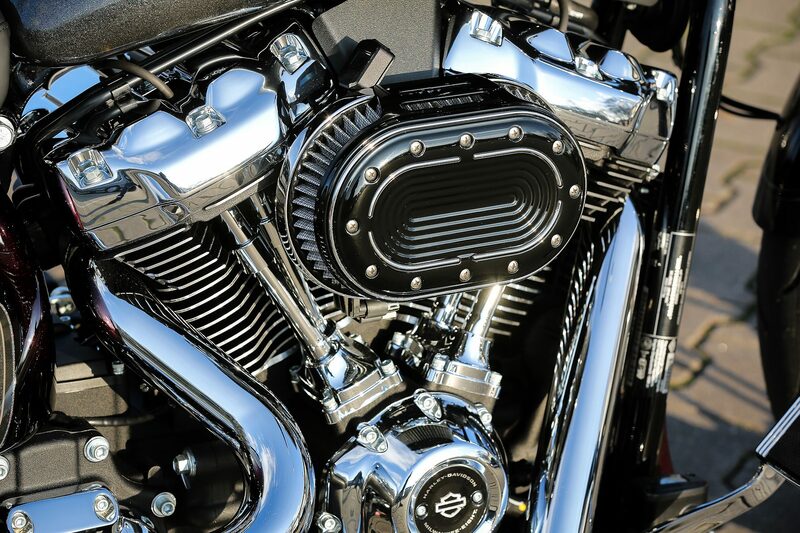 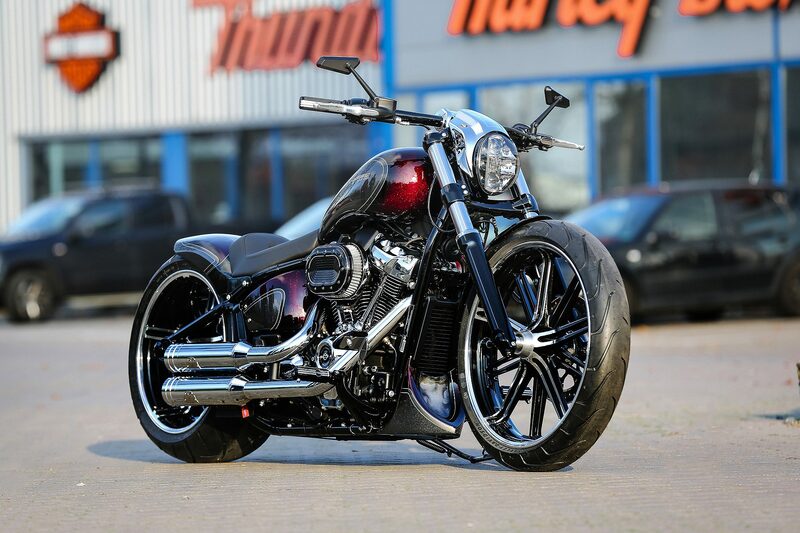 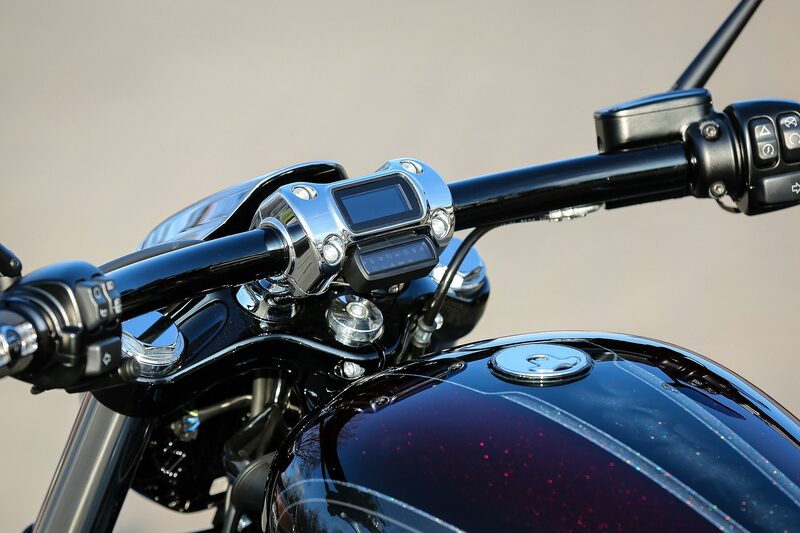 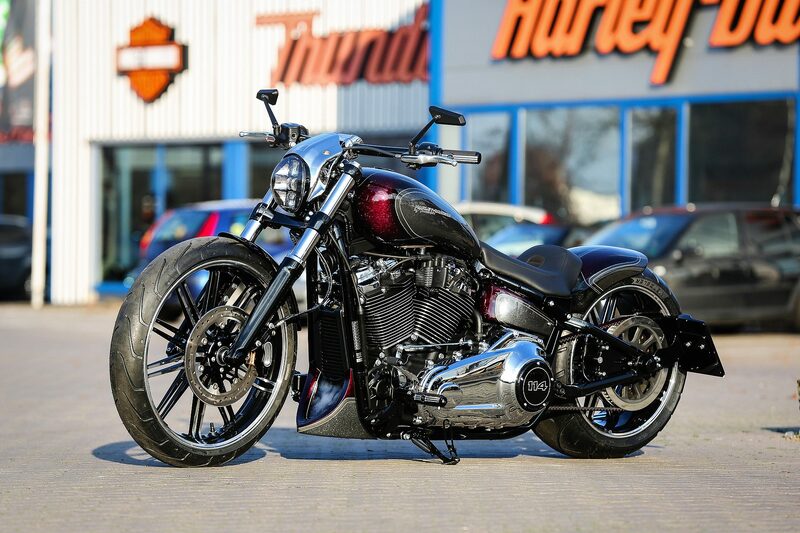 This Milwaukee-Eight conversion got the complete range of Thunderbike parts from us. 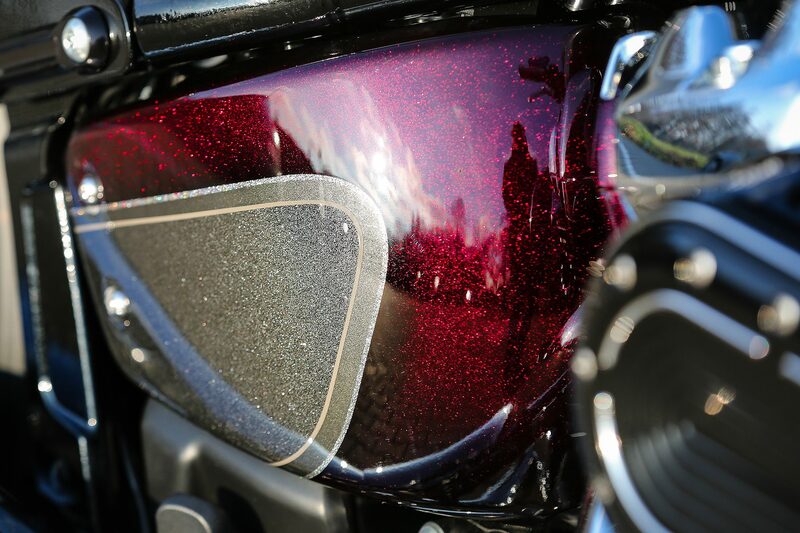 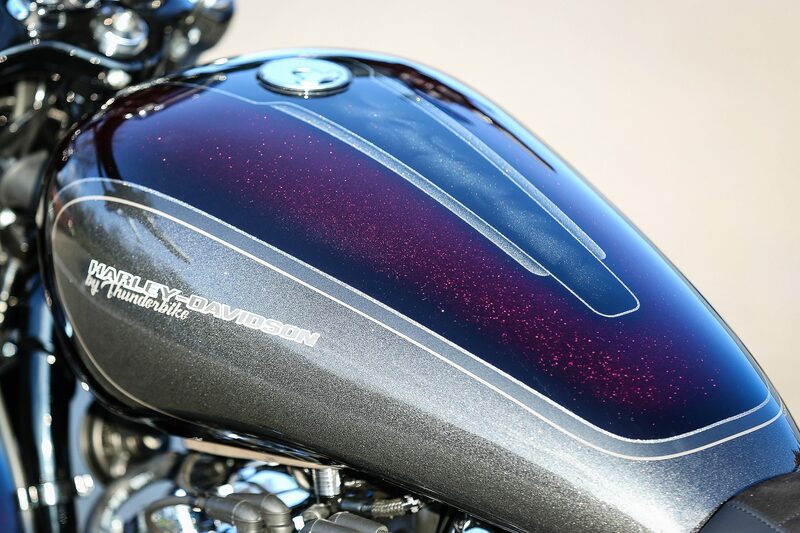 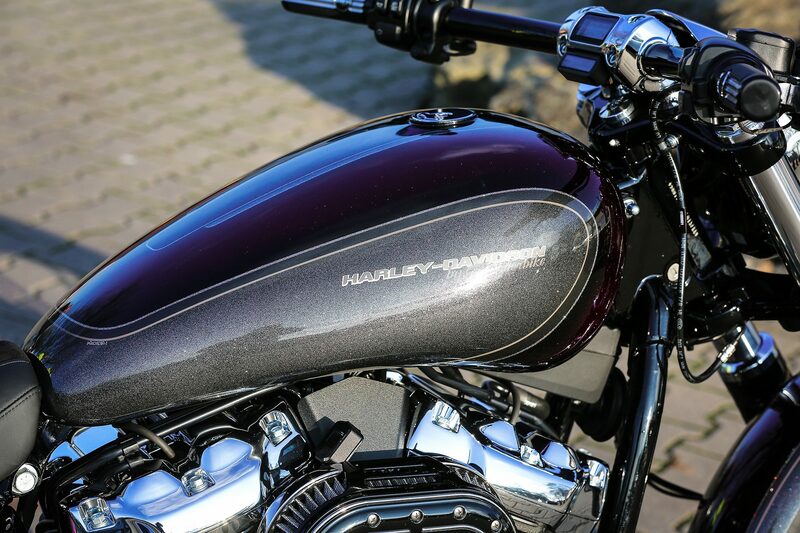 As the name Purple Grace suggests, the bike is decorated with purple metal flake contrasts. 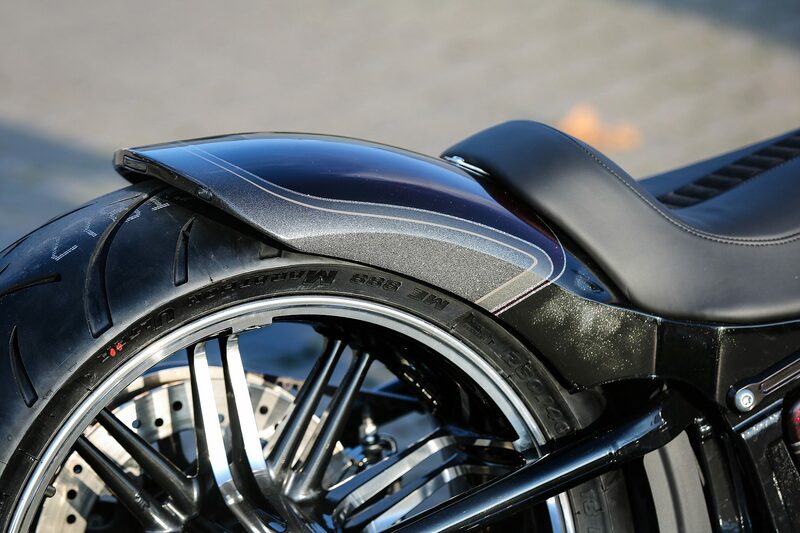 The paintwork was done by none other than our master painter Ingo Kruse from Kruse Design. 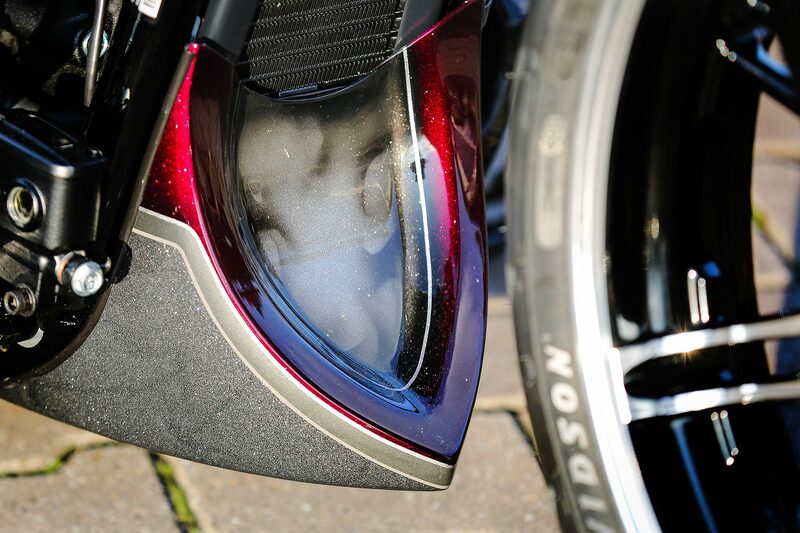 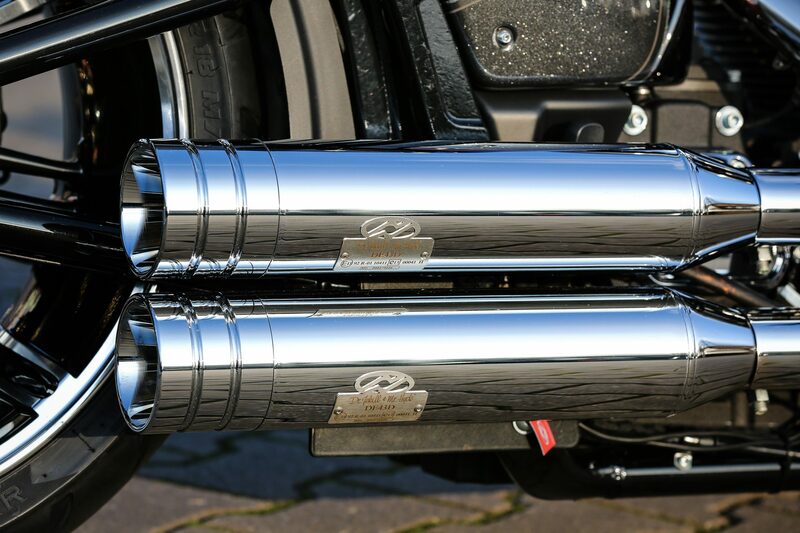 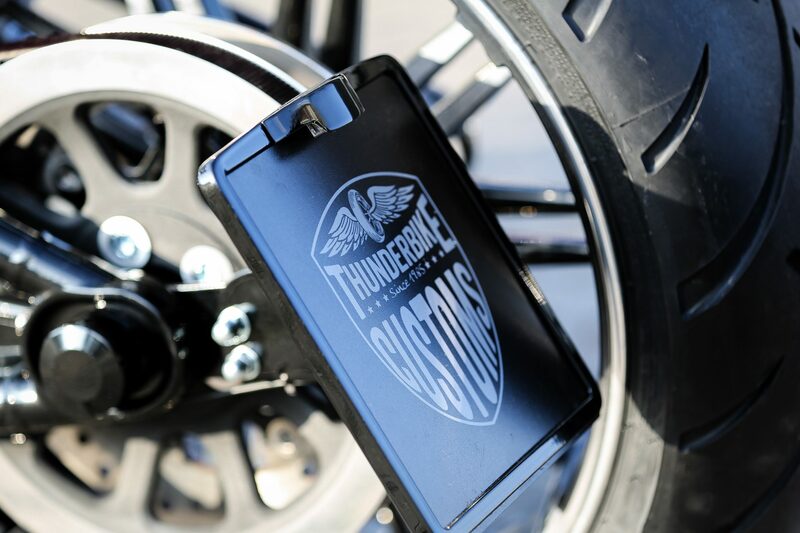 The most popular modification for us is the modification of the rear section, which is decorated by the complete Thunderbike package. 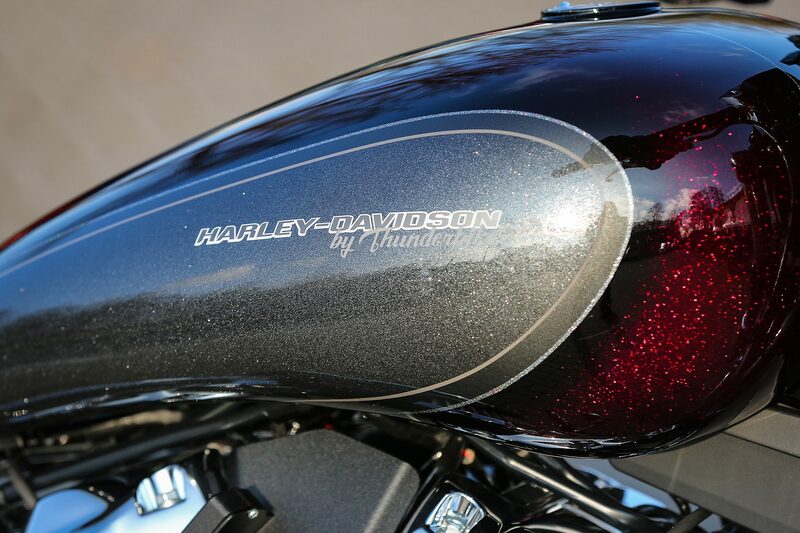 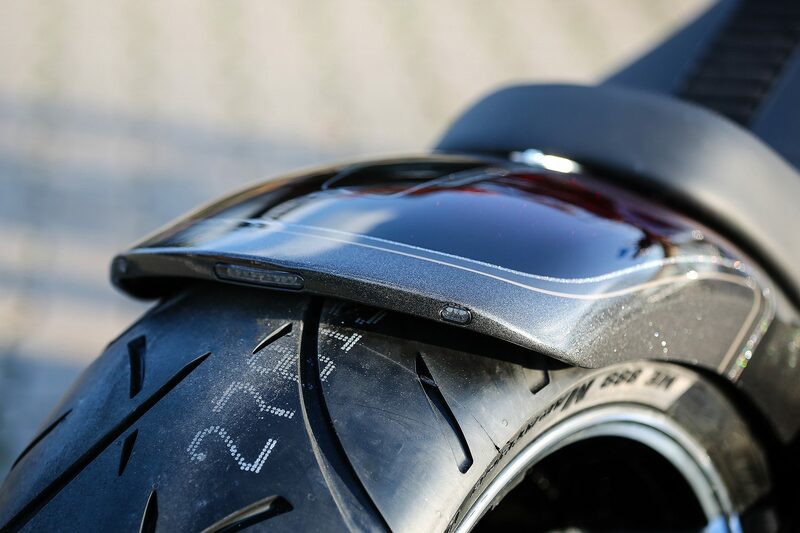 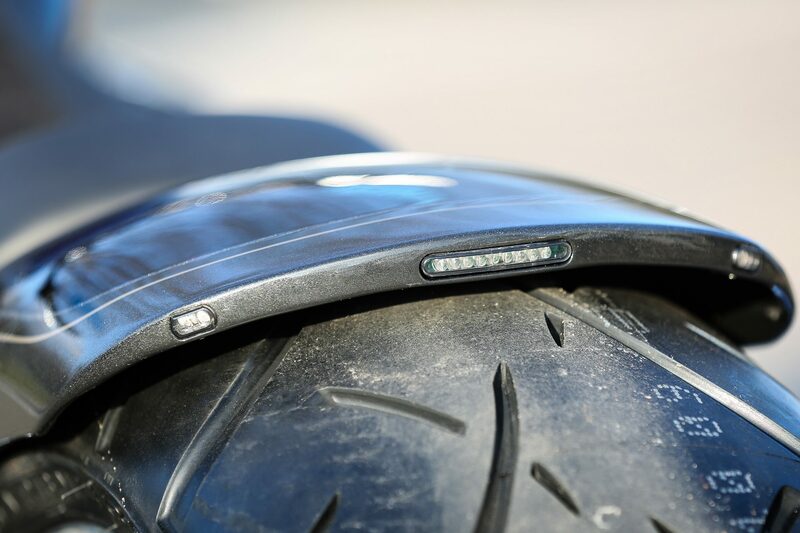 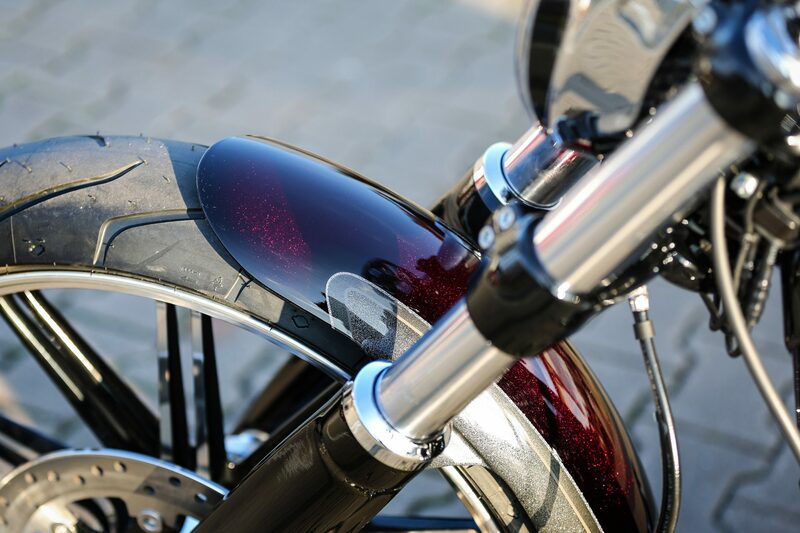 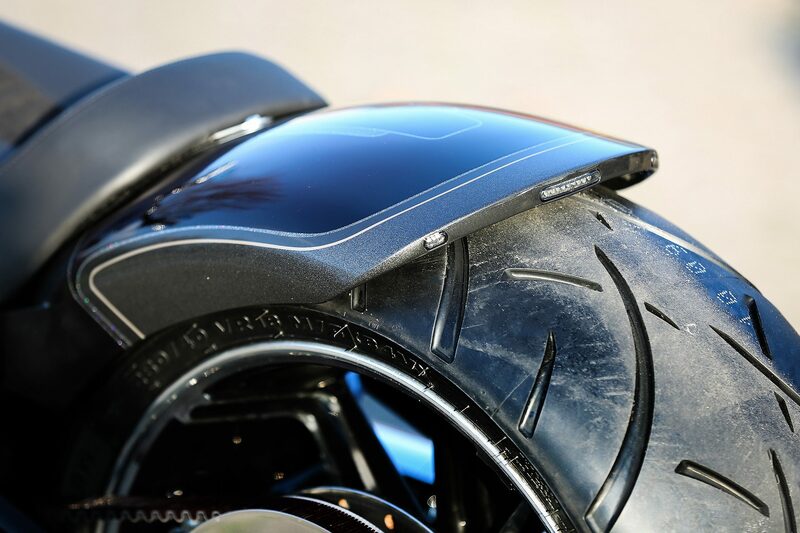 Starting with our rear fender Steel in the 260/18″ version including rear light and turn signal, which changes the view on the rear tires already substantially. 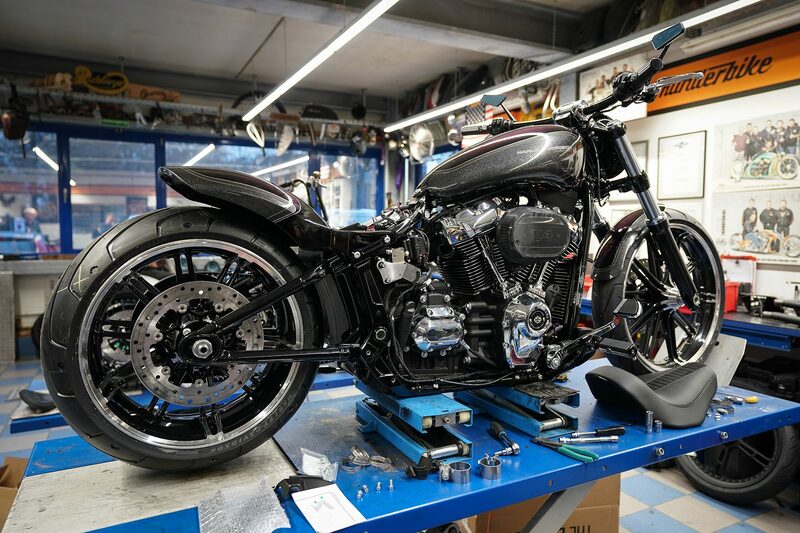 Such a rear modification brings of course also the relocation of the license plate holder, which also comes from our forge. 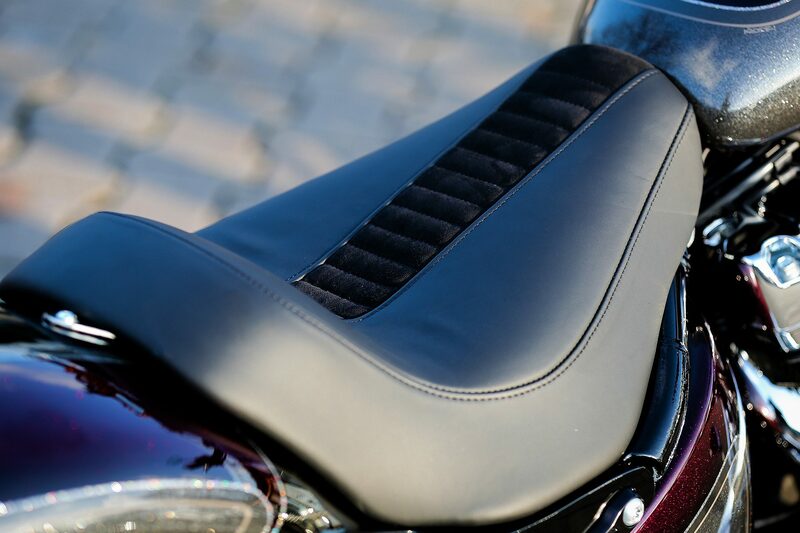 The single seat 206/18″ was specially developed for this conversion and can be ordered online from us. 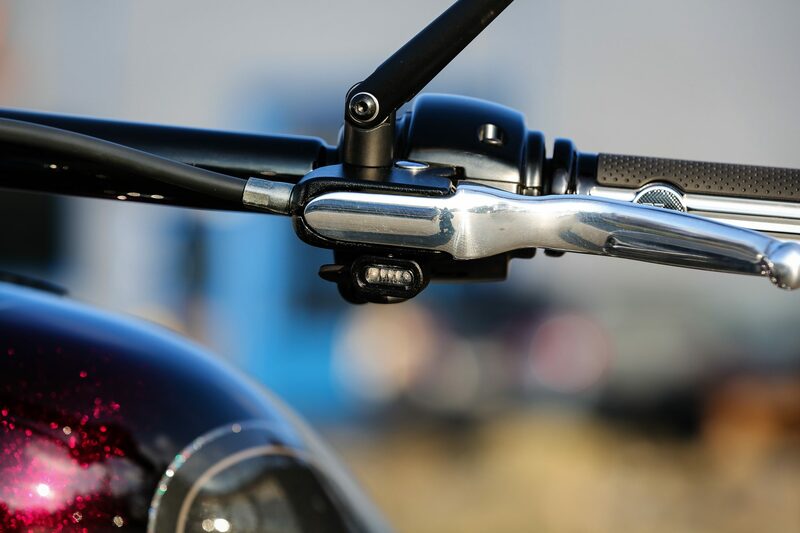 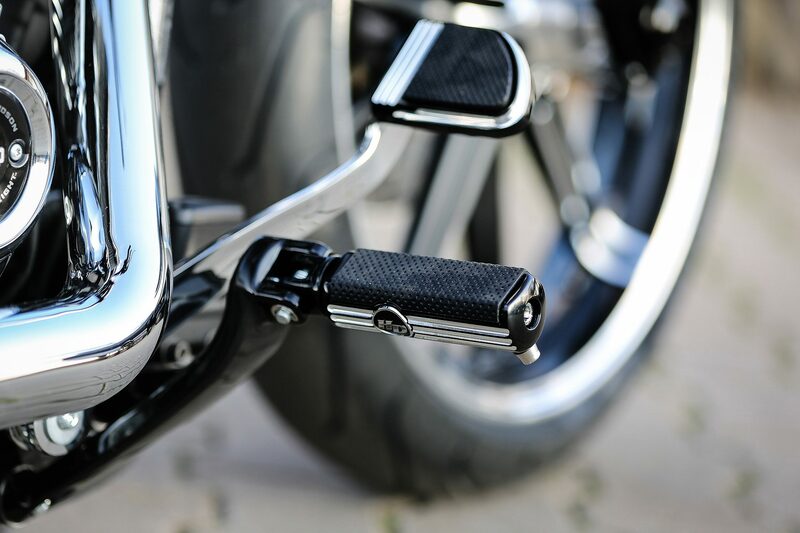 The Thunderbike Air Ride Suspension Kit, which is also available from us with a TÜV certificate, offers the perfect synthesis of tough optics and riding comfort. 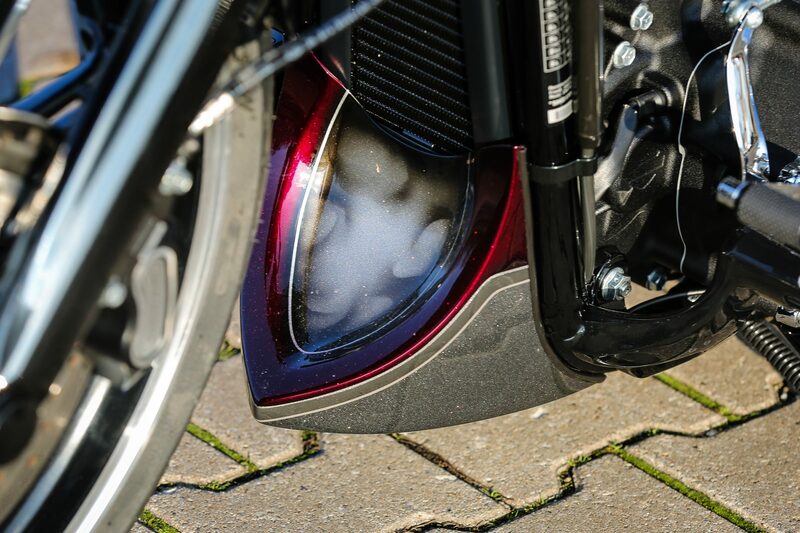 The small but fine differences to the original bike are covered by the different covers, like the axle covers or the airbox cover in Thunderbike style. 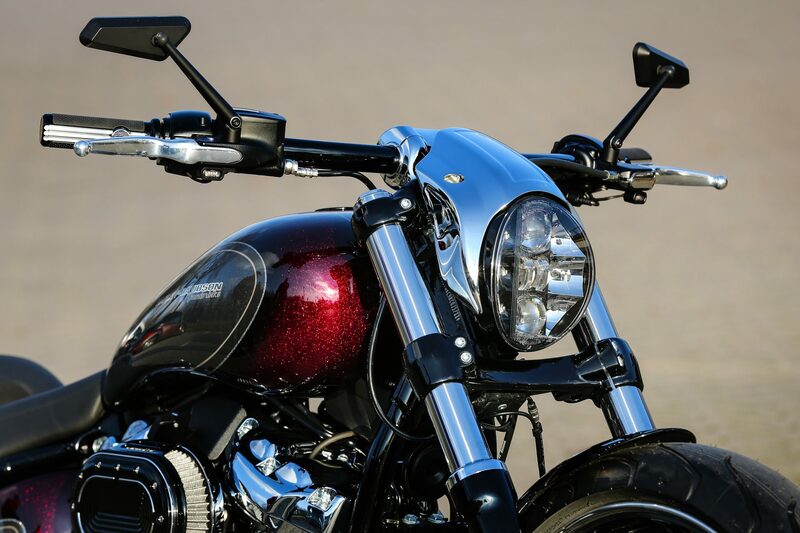 The front spoiler Crossfire from our assortment provides the short sporty line in the front area and supplements the front fender, which is also available for breakout conversions. 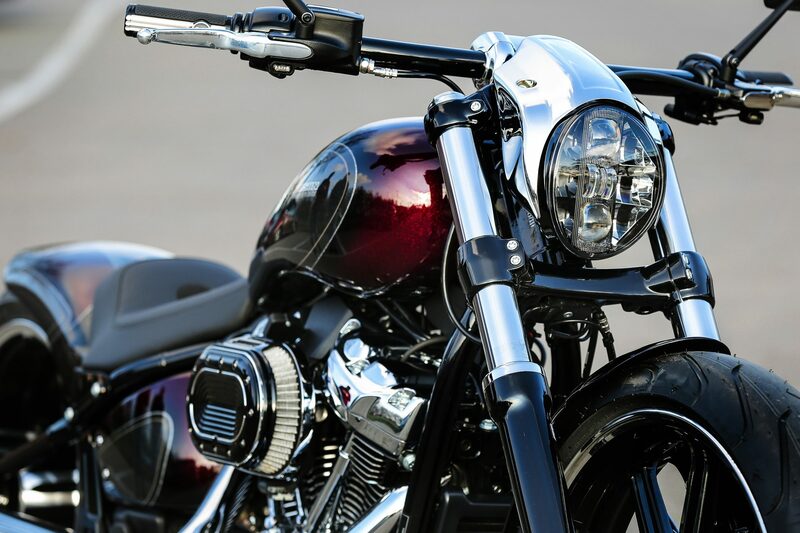 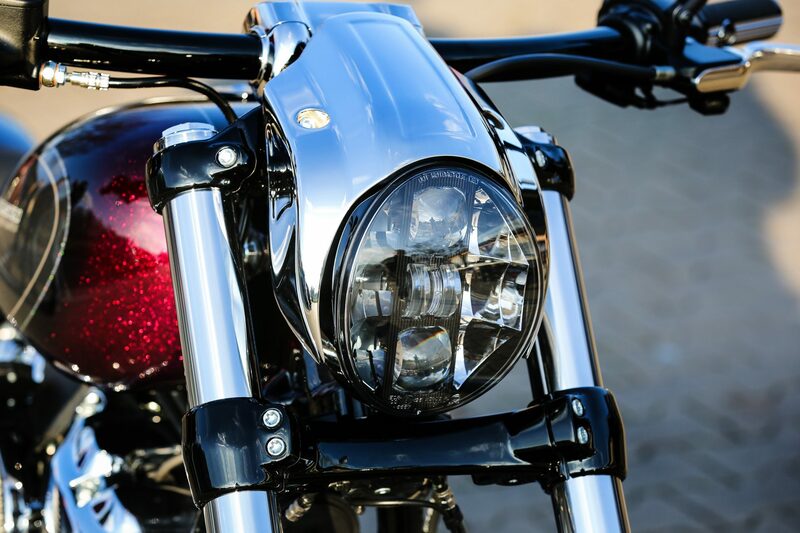 A popular alternative to the original headlight is our Headlamp Cap, which also delivers a sporty look in drag style from the front. 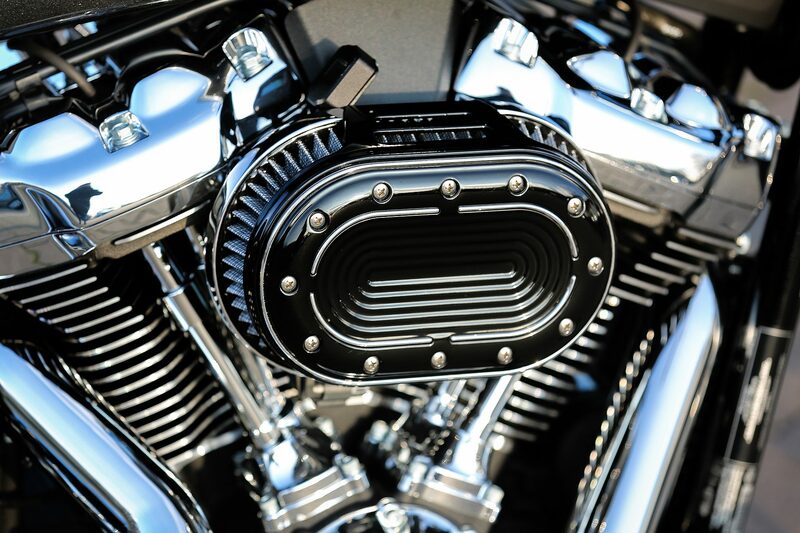 As usual you will find a parts list with a link to the shop under the gallery. 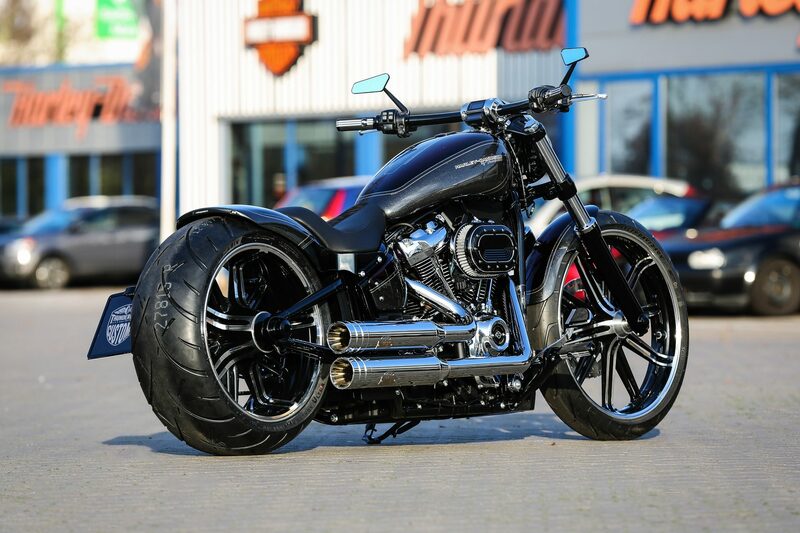 Do you have any questions about the conversion? 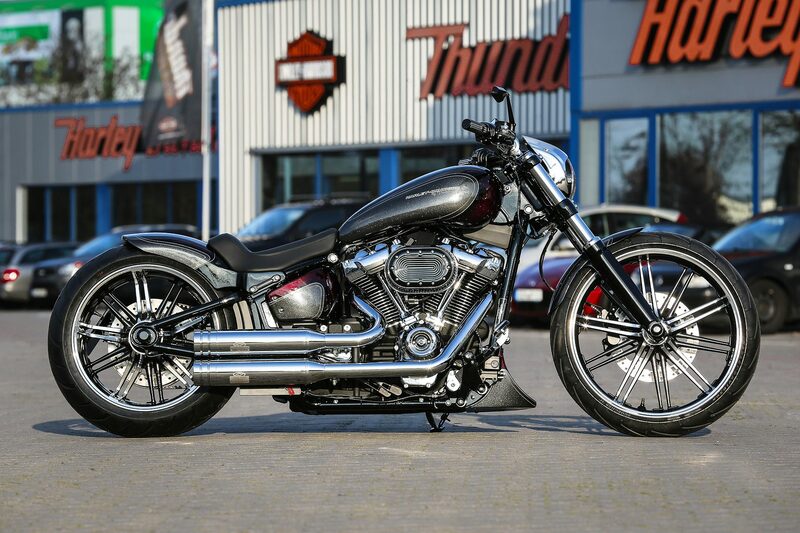 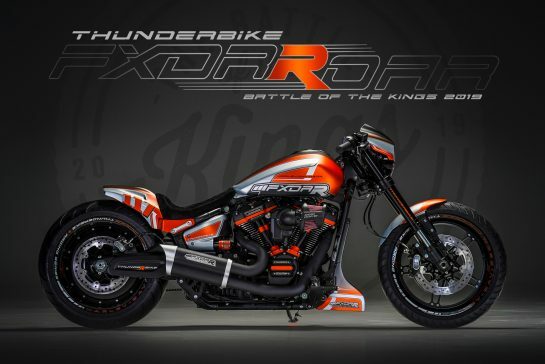 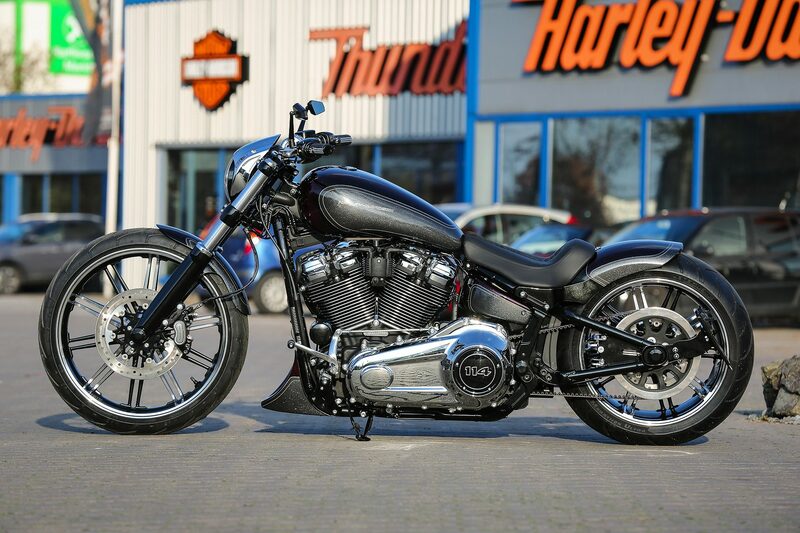 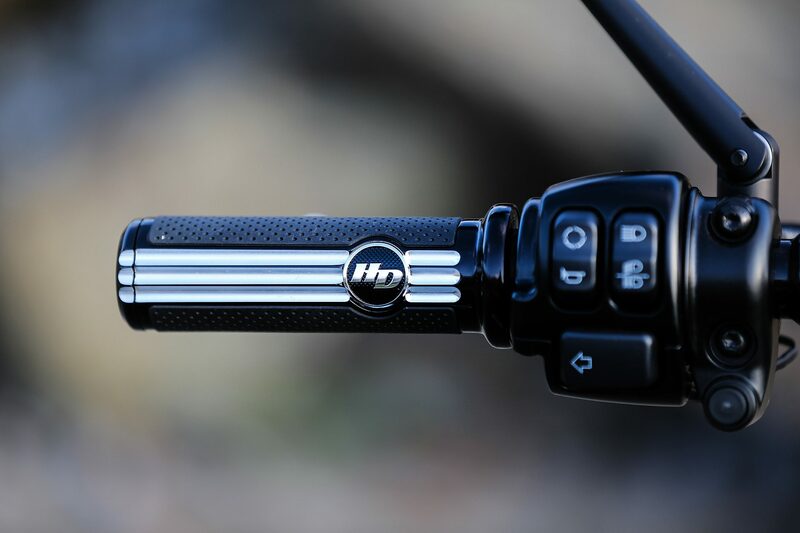 Just write a mail to info@thunderbike.de.